Pneumadyne has been manufacturing high quality, high performance hydraulic and pneumatic valves for nearly 40 years. 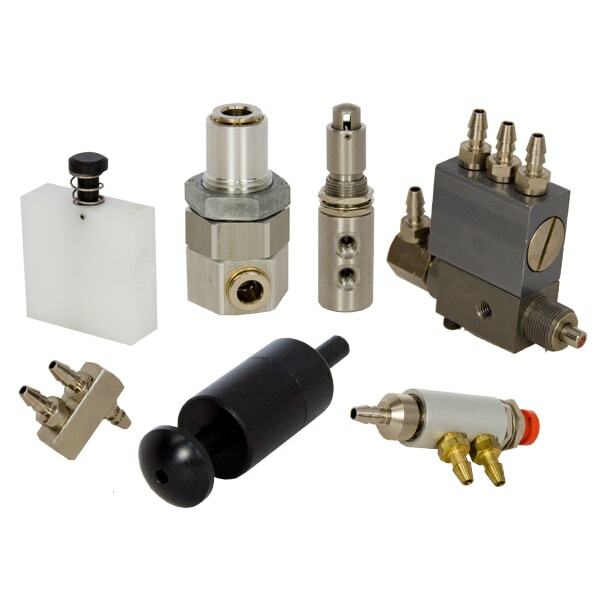 We offer standard valves in in a variety of sizes and configurations, all of which can be modified in numerous ways to meet your needs. Or, we can put our engineering expertise and innovative manufacturing capabilities to create a custom air valve that matches the requirements of your unique application. Pneumadyne’s team of experienced engineers will work with you from the initial design stages through the production of your finished product to deliver custom pneumatic valves that will meet or exceed your expectations. We can work from your design files, or develop a completely new design that matches your specifications for fit, form, and function. We can manufacture your custom valves from a wide range of materials, including aluminum, brass, stainless steel, and various plastics. Pneumadyne has been designing and manufacturing custom components since our inception. Our engineers take the time to understand customer applications, and provide innovative custom solutions for each customer’s unique requirements. Quotes for custom air valves can often be provided in as little as one week. The combination of our fluid power knowledge and our manufacturing capabilities enables us to integrate numerous components into a complex valve packages. These air valve packages simplify the installation of the components and eliminate potential leak points, saving our customers time and money. For high performance pneumatic valves that match your exact specifications, turn to Pneumadyne. Request a quote on custom air valves for your fluid power application, or contact us for more information.